Secretary-General Ban Ki-moon today stressed the importance of a global ban on nuclear tests to achieve a safer and more secure world, calling on all States that have not yet done so to sign and ratify the international treaty that seeks to achieve this goal. “Nuclear tests remain a threat to human health and global stability,” Mr. Ban said in his message for the third annual International Day against Nuclear Tests, observed on 29 August. The Day highlights the efforts of the UN and a growing community of advocates, including Member States, intergovernmental and non-governmental organizations, academic institutions, youth networks and media, in informing and educating on the importance of the nuclear-test-ban. The General Assembly chose 29 August as the annual commemoration date since it marks the day in 1991 when Semipalatinsk, one of the largest test sites in the world and located in north-eastern Kazakhstan, was closed for good. Mr. Ban noted that the Day is an important opportunity to call attention to the harmful and long-lasting effects of testing, as well as the continued danger posed by the existence of tens of thousands of nuclear weapons. The CTBT, which aims to establish a verifiable, permanent global ban on all types of nuclear explosive tests, enjoys near-universal support but has yet to enter into force. 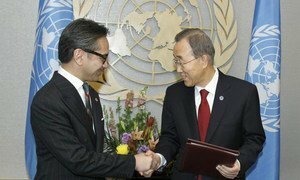 The Secretary-General is the depositary of the treaty, which, as of today, has been signed by 183 States and ratified by 157. Ratification by eight so-called Annex 2 States is required for the treaty to enter into force. They are China, the Democratic People’s Republic of Korea (DPRK), Egypt, India, Iran, Israel, Pakistan, and the United States. Pending the treaty’s entry into force, Mr. Ban urged all States to uphold the current moratorium on all nuclear test explosions. “However, while existing voluntary moratoriums on nuclear weapon tests are essential, they are no substitute for a total global ban,” he reminded them. The International Day against Nuclear Tests is being marked around the world with events to call attention to the dangers of nuclear test explosions, the threats posed to humans and the environment, and the need to ultimately eliminate all nuclear weapons and their testing. Secretary-General Ban Ki-moon today urged eight key countries that have not ratified the Comprehensive Nuclear-Test-Ban Treaty (CTBT) to do so and thus accelerate its entry into force, following the addition of its newest member, Indonesia.